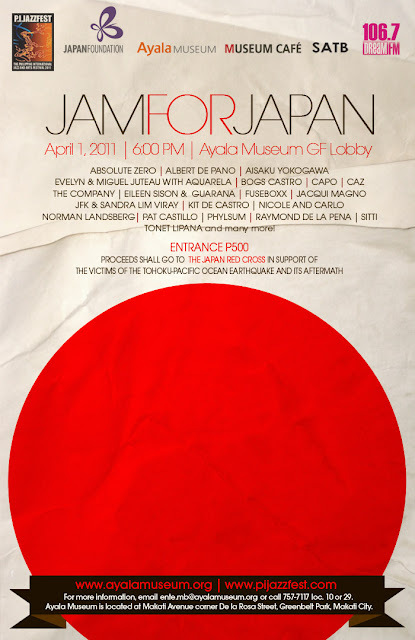 Music artists converge in a benefit concert featuring some 30 jazz, rock/blues, and pop OPM artists called Jam for Japan to be held at the Ayala Museum in Makati City on April 1, 2011 at 5pm (NOT 6pm as previously announced). Proceeds shall go to The Japan Red Cross to support the victims of the Tohoku-Pacific Ocean Earthquake and its aftermath. Featured artists will include Dulce, Jacqui Magno, Pat Castillo, The Company, Sitti, Marie Digby, Top Suzara, Eileen Sison and Escola de Samba, Julien Drolon, Aquarela, Johnny Alegre, Mia Tengco and the Absolute Zero Band, Nino Mendoza and the Blue Jean Junkies, Norman Landsberg and many more. Jam for Japan is directed by Dong Alegre, executive producer of Miss Saigon (Philippine production), and hosted by Japanese jazz crooner Aisaku Yokogawa. This event is organized by the Philippine International Jazz and Arts Festival Foundation and co-presented by Ayala Corporation, Ayala Land, Bank of the Philippine Islands, Globe, Manila Water, Ayala Museum, Museum Café, and Japan Foundation Manila. Additional support is provided by Philippine Primer, Ecomisimo, Cerveza Negra, SATB, Dream FM 106.7, Kinka Graphics, and Pray for Japan. Ayala Museum is located at Makati Avenue corner De la Rosa Street, Greenbelt Park, Makati City. For more information, call (632) 757-7117 to 21 loc. 10 or 29, or email ente.mb@ayalamuseum.org.